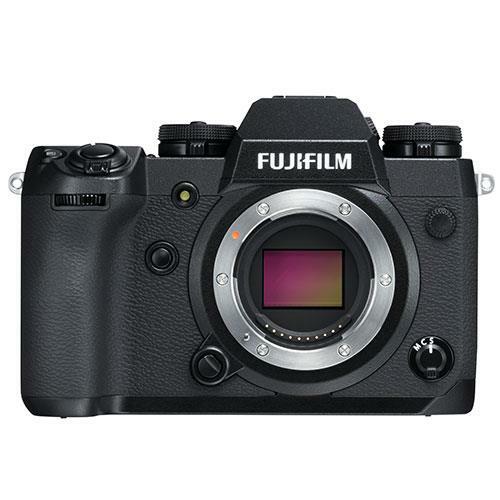 The X-H1 is Fujifilm's flagship X-series model and features a robust, durable body with a large-grip design. The X-H1 uses the APS-C size X-Trans CMOS III sensor (without low-pass filter) and the high-speed image processing engine X-Processor Pro. Also featured is a new in-body 5-axis image stabilisation, new Eterna Film Simulation feature for outstanding video reproduction, plus a flicker reduction mode which enhances the quality of indoor sports photography. The X-H1 has the quietest shutter sound of all cameras in the X Series, making it an ideal tool for wedding and wildlife photography. A comprehensive range of video features are included including 4K. The X-H1 has both Wi-Fi and Bluetooth connectivity. The X-H1 is the first X Series camera to feature in-body an image stabilisation. Up to a maximum of 5.5 stops image stabilisation, is possible when the camera is used with most XF and XC lenses. The X-H1 uses the APS-C size X-Trans CMOS III sensor (24.30 million pixels, without low-pass filter) and the high-speed image processing engine X-Processor Pro. This technology was first seen in the X-Pro2 and then X-T2 cameras. When used in combination with FUJINON lens, as well as the unique colour reproduction technology, the X-H1 produces outstanding, unrivaled quality images recording the finest details of the subject including texture, three-dimensional structure. In addition to the camera's dust-resistant, water-resistant properties, and the ability to operate in temperatures as low as -10°C, the camera also uses a 25% thicker magnesium alloy compared to the X-T2. The mount structure has also been modified, resulting in a more compact size and lighter weight body that maintains high precision and strong resistance to impact shock torsion and other sources of deformation. The camera uses a large-grip design with the new shape and a leaf-spring switch for the shutter-release button to achieve a stable feel when holding the camera and easy operation of the shutter-release button. The rear LCD monitor is a 3-direction tilt, 3-inch, 1.04 million dot electrostatic touch-panel LCD which can be intuitively set to the desired angle. In addition, the 1.28 inch sub-LCD on the top of the camera, a current feature of the medium format GFX 50S, allows for instant confirmation of shooting information. Flicker reduction modes are essential for indoor sport photography, and the X-H1 achieves this using a mirrorless camera, allowing for stable exposure during burst shots even under fluorescent and mercury lighting. In addition, improvements to the AF algorithm have been enhanced.